I’m currently completing a series of 6 paintings based on Native American legends. 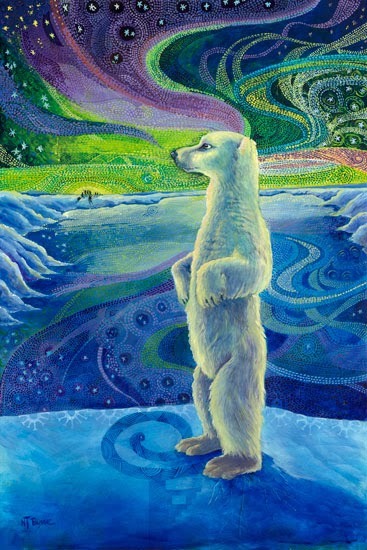 This painting is based on the legend: How the Aurora Borealis Came to Be. After the great flood, the planet tipped on its axis, plunging the North into long periods of darkness. In the North there lived a group of people who had been spared from the flood. But when they could no longer see the sun or feel its warmth, they became sad and afraid; cold and hungry. The Great Mother felt compassion for the People and told them to gather their belongings and walk south, where the sun would shine and provide bounty and warmth. But because there was no light and little food, many of the people perished on the dark, cold journey south. In a stroke of genius the Great Mother covered the top of the world with mountains and hills made of ice crystals. The ice crystals captured the sun’s rays and reflected them into the black sky and so illuminated the nomads’ path. They could then journey south under the shifting, humming rainbow of light and became the forerunners of many of the great tribes of North America. But the white bear stayed in the Great North. He stayed because he loved the beauty of the inky darkness, the music of whale song and sea birds, and the deep comfort of solitude. Visit http://NanceeJean.com to view my fine art and illustrations.